Words are all I have…or do I? I’ve been trying to stay aware of current events since I got home from Mount Rainier. This is very hard on me because they often make my stomach turn. The US was part of bombing a school bus full of kids in a busy market place? Children, some still babies removed from their parents and put in cages? I decided to stay in the know, as much as I can stomach, because it seems like outrage is the only thing that gets attention. That is a really stupid way to operate. Especially for a nation that is supposed to operate by rule of law. I observe that we seem to have a bit too much regard for attitude over actuality. The speaker was Jill Wine-Banks, I can’t remember the program, in the short segment she suggested using the word “conspiracy”* instead of “collusion”, and talked about #saythisnotthat. Totally agree with her premise. I’ve been uncomfortable for a long time about the words people are using, corrupting in some cases. Another word that should go away is “conservative”. A conservative has respect for institutions, like the court system, schools, government and so on, realizes a need for a rule of law and respect for the constitution, and realizes that you have to balance income with expenses. Someone like George Will is accurately described as a conservative. Many people currently claiming this identity are not conservatives; they should simply be called “Trump Supporters”. While I would, before my media blitz, have said that the word should be reserved for true conservatives I now believe that, like I can’t have a “tea party” anymore, the word is too far gone to be retrieved. Probably we need to let “Liberal” go as well. It is mainly used by Trump Supporters to mean someone they want to bait into lashing out at them so they can play victim. Another term we may want to let go is “mainstream”, because it means too many things to too many different people. In my attempt to try and understand things I have been driven to watching several different venues. A thank you to someone who posted as a response to Fandango a link to a chart that judged the various media sources as right or left biased. I made a mental note of a few, trying to get different viewpoints in my media consumption. When I went back I couldn’t relocate that exact reference to share it with you here, but if you Google “right left media chart” there are a whole bunch of them…and they are not all the same. I think, but am not sure, that this post: US Media Bias Resources, might contain that first one. I find that I am more in concurrence with the one posted in Partisan Bias vs. Journalistic Quality. The reason is that I think the person/people who put the first chart together are using how much the labeled groups like, or the opposite groups dislike, the reporting as an indication of bias. The chart seems to me more like a warning for people who have opposing views that they may not like what they see than an assessment of true bias. You have to take into account what really happened. For example: If I love cats I can like a story about rescuing kittens, but that doesn’t necessarily mean that kittens were rescued. If I am a dog lover, maybe I don’t like the story about rescuing kittens, but that doesn’t mean that kittens weren’t rescued. They over generalize. You are considered either left or right or liberal or conservative. I find that many real people, myself included, don’t fit into those categories neatly. To use my example from above: I love both cats and dogs, so I can like stories about both kittens and puppies, so long as I don’t bring any more animals home (my husband, the cat, and both dogs agree on that). Much factual news today doesn’t suit the Trump Supporters worldview so they claim bias. I don’t like news about bombing school buses…but it really happened. I don’t claim reporters are biased because they tell me about it. When I was a kid on the evening news they always had the death toll for the Vietnam War…whoops I mean Police Action (although everyone called it a war at the time, one kid in my Kindergarten class’s dad died fighting over there). Now, just within my family, some people supported that war and others did not. But no one, on either side, claimed that there weren’t any deaths. Rant over for now. I wish I could find out more about the #saythisnotthat stuff, but I’m not a twit…wait no, I should report accurately: I do not have a Twitter account…and I stopped using Facebook a while back for practical reasons (it ate up my cell phone battery trying to update itself). Grace and peace to all, we sure seem to need it. *Couldn’t help but notice that it could be re-punctuated to read: “con’s piracy”. **My opinion is that when you get too extreme, on either “side” of the political spectrum, you should be referred to as a “wing nut”, but that sounds judgmental, and didn’t some famous dude say “judge not that ye be not judged”? …I wonder what he would have said about the current situation? Based on years of Bible study, I’m guessing that bombing school kids and folks out buying food wouldn’t fly very high with him, nor would storing children in cages. Just sayin’. Chinese is a tonal language…what does that mean? It means that the tone is part of the word, just like which syllable you accent or how you pronounce read (present tense) versus read (past tense). In Chinese it is more extreme than read vs read; the word “ma” can mean mother, hemp, horse, scold or act as a verbal question mark, depending on tone. In English we use tone primarily to add an element of attitude or emotion to the meaning of the sentence, for example a rising tone makes the sentence questioning (our question mark indicates that a sentence should be read with a rising tone) or a falling tone can indicate that you really mean it. The tones add the same element of meaning regardless of what the words are. When we say “watch your tone!” in English it is an admonition to pay mind to your attitude, to be respectful. In Chinese it would mean something closer to “be careful and precise to make your meaning clear”. I am not lazy, but I lack aptitude for language learning. Unless I have a goal it is hard to motivate myself to buckle down and really learn a language. Other stuff drifts to a higher priority. I am trying to learn Chinese, again. This is my third try. Language isn’t my thing, even in my native tongue when I need words they just don’t come. One reason that I rarely post is that it takes me longer than a day to pull together a response. I really want to be able to communicate with people on my own. I want to go to a couple of places that are not on the western tourist track on my own. I only decided to go about two months before takeoff, a very short time for someone who is all but tone deaf to try and learn a tonal language. Before my first and second trips I tried using two different book plus CD programs. With the first, I ran through it once then listened to it in the car. After almost a year and a half of doing that, including several trips to and from California where I heard all three CDs twice a day, I made almost no progress. I was unable to recognize the words when someone other than the canned voice spoke them, or come up with them myself in real life situations (Although, I can say nihao and xiexie). But worse than that, I really could not speak the phrases in the phrase book. I couldn’t figure out how to follow and correctly pronounce the pinyin (Chinese phonics system). Nor could I recognize if someone responded with a phrase in the phrase book. With the second I just couldn’t get into it. I think it was designed more to be used as an aid in a class where the instructor took you through it rather than working on one’s own. I took that one with me to China last time and tried to work on it in the morning then go out and listen for the phrases. I never recognized a thing. This time, with six weeks to go before take off I started an on-line course (YoyoChinese.com). This seems to be going better. It helps to be able to see the person forming the words, and they focus on how the tones sound in a variety of real words (saying “ma” five different ways many, many, many times really didn’t help me). It also has a Chinese on the Street segment so you can hear a variety of voices using the material in context. So every morning now I am spending 45 minutes to an hour studying Chinese. I know that some people have a better ear, are more linguistically oriented, and are more courageous about trying than I am, but I really think the idea that one can just pick up a language with no effort is blarney. T – 14 days for my real life test, I’d better get back to work. The things going on in my life of late have been causing me lots of negative emotions: frustration, sadness, anger. Those emotions tend to silence me. At one point this past week, I was tempted to go and shout at a couple of people, in a very sarcastic tone, “Heaven forbid that anyone ever do anything that is easier or more convenient for ME! !” Followed by the suggestion that they should take a long hike on a short pier. I did not do that. I do wonder a bit what the shock of the worm turning would have done to them. I realize that my time and feelings are of no value in the grander scheme of things, but I am trying to train myself that they should at least matter to me and get out of frustrating situations that I can avoid, since there are plenty I can’t. Hopefully I did not go too wrong in saying that. Most things do pass or get resolved without saying anything, and saying hurtful things doesn’t usually ameliorate a situation. But I am trying to learn how to take care of me, and just letting people roll over me without saying anything at all doesn’t seem right either. I don’t think it is wrong to walk away and just leave a confrontational situation much of the time. Frequently people are simply not interested in anything except their own viewpoint and showing they are right, they just want the eye-of-the-tiger adrenaline rush of rising up to the challenge of a rival. Letting that fall flat is enough. It is not really worth the time and effort to correct folks, or stand up for yourself, most of the time. One thing that always puts me at a disadvantage in stressful situations is that my feelings are feelings, not words, and it takes me a while to figure out how to put them into words. By the time I figure out what to say, the more verbally oriented have manipulated me and/or the situation or ranted until I am cornered, feeling wronged and inadequate and all I want to do is go away and be left alone. A week or so after the fact I often come up with a brilliant retort. But, like my tiny bit of Mandarin, the brilliant rebuttal never comes to mind when I really need it. This isn’t a very happy post, but I am starting to plan a couple of humorous posts about some of the past week’s dramas. Just starting to see the humor in the situations is a sign that I am starting to bounce back. But it is going to take me a bit of time to find the right words. I started this blog when I took a class in creating websites. I wanted to experiment with layout and techniques beyond the class assignments, so I needed to create some “content” to play with. What I had easily available was my own life…but words do not come easily to me. Often my “story” is a sensation (touch, smell, taste, sound or picture) that triggers a feeling. How can I communicate that feeling? Learning communication through composition isn’t something you ever finish. It cannot be done once and for all, so I need to keep at it and to take a look at how others approach the same themes. I didn’t know when I threw the first bit together, but that is what blogging is. So here am I, on the downhill slope of middle age learning to “use my words” with a picture here and there thrown in because words don’t always do it. Not very clever: it is Latin for “spring in winter”. It’s happening right now in Seattle. 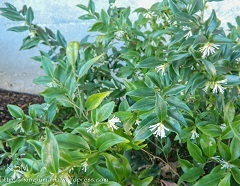 The news is full of blizzards, and for some that is marvelous (see post by Karyn here), but here the air is full of the scent of daphne odora and “that plant that starts with an ‘s’, smells divine and blooms in January”. 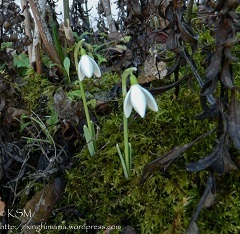 The leaves and buds of bulbs are thrusting vigorously up through the mulch of partially decayed leaves…but winter is not necessarily over. This little party will end with a shift of the wind. In some ways that makes it all the more precious. For that reason it is also accompanied by a sense of urgency to get outside. This differs from what we call the “pineapple express” which is warm but comes with a lot of rain. Got to go and enjoy! Modern Communications-Is it QQ* Translate…or Chinese itself? I am sure she typed it in cogent Chinese. It is the middle of the night in China right now so I have to cool my heels for several hours before I can get clarification. This is not my first somewhat obscure message, I no longer panic that I cannot call right away. Instead I amuse myself during the waiting time by guessing what the message might mean. The first message that comes through was unintentional on her part. When I tried to QQ and call James last night I didn’t get through. This message tells me clearly that James is fine (one time when I couldn’t get through he had been mugged and had his phone stolen). The essence is that James was worried that I didn’t call yesterday. However, since he could have QQ’d me himself, Emily may be more worried than he is. “I told him, something the mama” is a bit puzzling. Was she worried that something is wrong or comforting him that I was busy doing something? When I tried to learn some Chinese I noticed that they put an emphasis on different aspects of language than we do in English: for example, they do not pluralize nouns or use verb tenses. So a sentence can have both ambiguity about what the subject is (is it a generalization about dogs, or a statement about a particular dog or group of dogs) and when in time the action occurred (is the dog running now, did it run in the past, or will it run in the future?). However, the Chinese seem to have more precision when they talk about emotions than we do. For example, they have about 20 words for happy, discerning between a general state of contentment, delight in the moment, and a feeling of being fortunate. The words Emily typed in Chinese that came out as “something the mama” and “he was a little worried”, could have had much more precise meanings than what came though in translation. For example, the Chinese word she used that got translated as “something” could have been a word with either calming or alarming overtones. In English we would perhaps have used more words: “something came up”, like an invitation to have coffee with an old friend, or “something happened”, like the car broke down. I wonder how much our language affects our thinking. Do we who speak English care more about whether it is a generalization about dogs or the behavior of a specific one because our language teaches us to do so? I am pretty sure that “give him the phone number tomorrow” means give him a call. A few more hours to kill. *QQ is a Chinese Facebook-like communications program. It is by far the largest one used in the world. It is used by almost all Chinese people with cell phones and by people who want to communicate with them easily. I can send a QQ IM and will usually get a response in a few seconds.